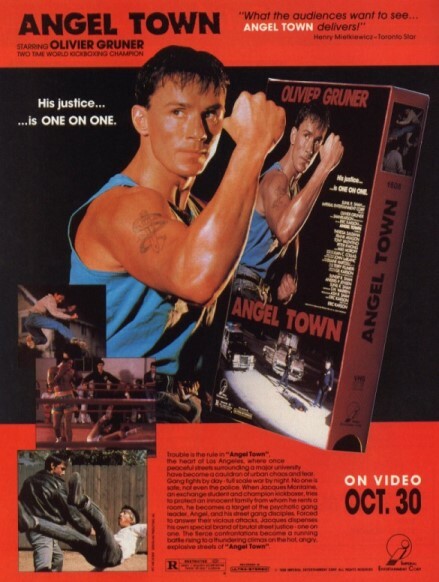 Angel Town a film from Imperial Entertainment put Olivier Gruner on the Map in the martial arts film world. Already a champion kick-boxer and ex- French Marine Olivier Gruner turned his hand to action film making . 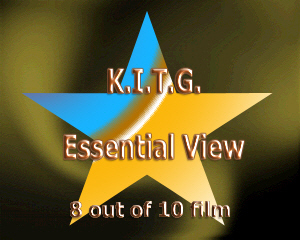 Now for a lot of martial artists who try a hand at action film making it does not always go to plan as what they portray in real life does not always come across well on screen in a entertainment value . But luckily for Olivier Gruner his dynamic kicking ability and speed which he possess set him in good steed for a market of crazed fight film fans. Angel Town sees Olivier play one Jacques a French graduate student who goes to LA to enter a engineering study. Arriving late he ends up getting a place to stay in the ghetto of LA where the Latino and Black gangs rule the streets with a hard hand, either your in a gang or your dead meat . The house he gets a room in is home to a young woman (Maria) and her teenage son (Martin) along with his grandmother. Trouble comes to their door when local Latino gang leader ''Stoner'' wants Martin to join his gang,but his mother and grandma don't want him too. Constantly on the run from the hoodlums the family get harassed and verbally attacked more often then not. And the Police don't attend as it's considered a no go zone. But Now Jacques has arrived ,and this man does not take any crap from anyone. Brought up in the ghetto's of France and having lived in the rough side of Hong Kong it looks like the gangs are in for a fight they won't forget. 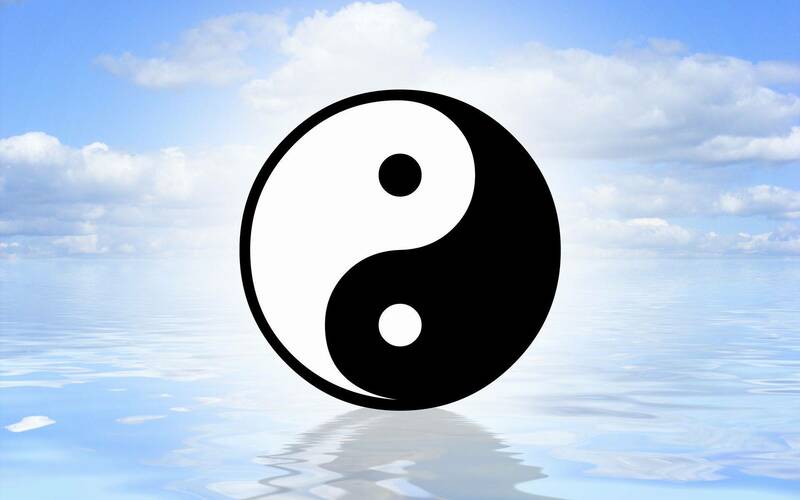 But when things get out of hand Jacques takes Martin to a friend who runs a local martial arts center ,it's here that Martin will learn who Jacques really is and how he will not back down . This will get the Gym's owner ,Henry (Peter Kwong) involved in a war he did not want. Henry new Martins dad who was killed by the gangs for standing up and trying to unite a community to rid the streets of the gangs. Once again Henry will find himself in a war instigated by the determination of Jacques to make Martin stand up for himself in the right way and bring a end to the troubled streets they live on. Now for a film that was his first role ,this is a blinder of a film and one all Martial art fans should have seen at least once. The combination of gang violence and Olivier Gruner's display of kick-boxing the film becomes a roller coaster ride of fights and tension as Jacques gets under the skin of Stoner the gang leader. With a good supporting cast in the form of Theresa Saldana as Maria and Peter Kwong as Henry the film has a better then budget feel to it . The fight action is well shot and with Jeff Imada on set to over see this you can see why. 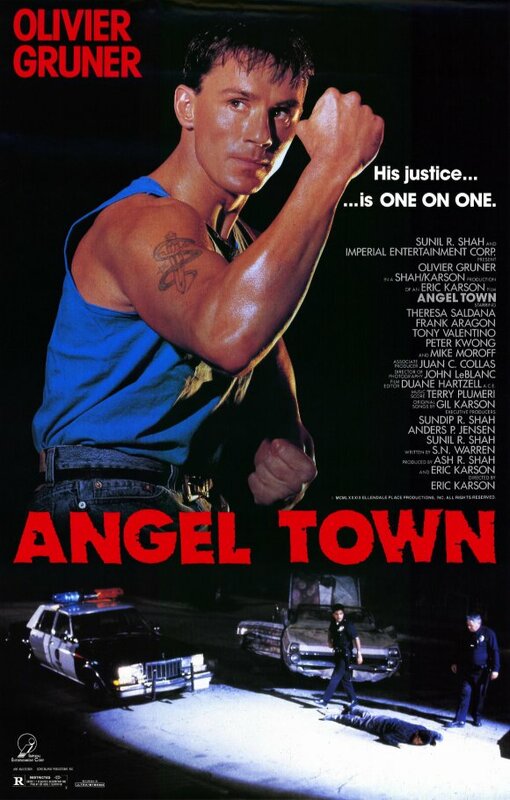 So if you want some good old 90's fight action without cgi and fast cuts then Angel Town will show you the way with it's pulse pounding fights and displays of energy not often seen in many American martial art films. From start to finish Angel Town will grab you and keep you there till the end. A fine film to push start any one's film career. 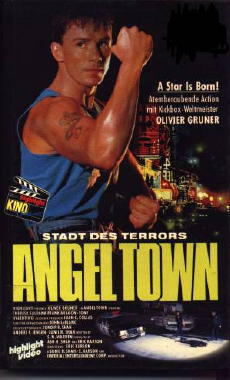 Above: The German Advertising for Angel Town. Angel Town photo gallery coming soon! 1) Mark Dacascos stars as Stoner's driver in a early role for the star. 2) Filming was suspended on set when gang violence broke out on set.